In the final week before earnings season kicks in, a trio of somewhat under-the-radar names hiked their payouts. We've now entered the final earnings season of calendar 2016. There are probably going to be a new set of dividend raises from noted companies in the coming days and weeks as many stocks lift their payouts concurrent with their latest earnings releases. As if to preview this activity, last week a number of issuers got a head start and announced dividend lifts. Here are three I believe are worthy of note. You might not know RPM International (NYSE:RPM) by name, but most likely you've come across at least one of its products. The company makes a wide range of specialty paints, sealants, and coatings, the most high-profile of which is oxidation fighter Rust-Oleum. Income investors might be more familiar with RPM International, as it's a dividend aristocrat -- one of the very few stocks on the market that has raised its payout at least once per year for a minimum of 25 years running. Sure enough, the company has boosted its quarterly distribution again, lifting it by 9% to $0.30 per share. Now is a particularly appropriate time for such a move -- in its Q1, RPM International's net profit notched a new all-time record at nearly $113 million ($0.83 per diluted share). This was a 13% improvement over the same quarter last year. Net sales could have been better; they rose less than 1% across that same stretch of time. Regardless, the company has managed to keep its free cash flow figure well in the black, and plentiful enough to cover even the raised dividend several times over. We can count on the stock, then, remaining a dividend aristocrat for now. RPM International's fattened payout will be distributed on Oct. 31 to stockholders of record as of Oct. 17. At the most recent closing share price, it would yield 2.5%, slightly better than the current 2.1% average of dividend-paying stocks on the S&P 500 index. 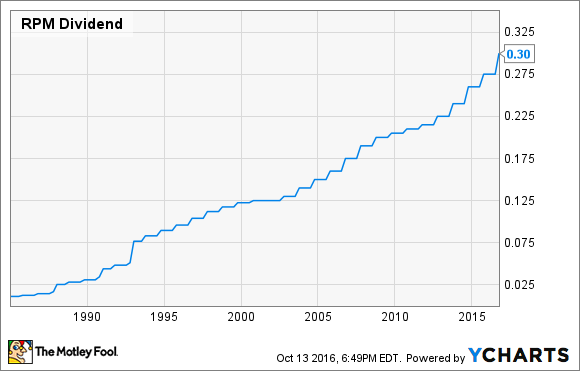 Another company that isn't quite a household name, despite a big presence in households, is Ingersoll-Rand (NYSE:IR). The climate control specialist has been a yearly raiser of late, and 2016 is no exception. A quarterly dividend of $0.40 has been declared, which is a sturdy 25% higher than its predecessor. The announcement comes ahead of the company's Q3 earnings release, which investors will hope is as pleasing as its Q2. That was a good quarter, with adjusted net income rising by 11% (to almost $360 million) on a year-over-year basis. Revenue also saw an encouraging uptick. But Ingersoll-Rand might disappoint the market a bit going forward. It's forecasting annual revenue growth for this fiscal year to be only 1% to 2%, with earnings of $4.00 to $4.10 per share very likely coming in just under the average analyst estimate. Still, that EPS range represents a healthy increase over the $3.73 the company posted in fiscal 2015. A higher bottom line helps boost operating and free cash flow. Considering that the latter has been strong enough in recent years to cover the dividend more than twice over, I wouldn't worry about the viability of this new payout. Ingersoll-Rand will hand out the first of its higher distributions on Dec. 30 to investors of record as of Dec. 9. The new dividend yields a theoretical 2.4% on the current share price. Another habitual raiser, insurance conglomerate American Financial Group (NYSE:AFG), is making the customary once-per-year lift in its quarterly payout. Said raise weighs in at 12% over the preceding amount, at slightly above $0.31 per share. That should help boost demand for the stock, the price of which has been on a more or less steady rise over the past few months. Supporting this was the company's Q2 results, which blew past analyst estimates for revenue ($1.58 billion vs. the average expectation of $1.06 billion), thanks largely to higher premiums in its key property and casualty segment. American Financial also slightly exceeded profitability forecasts with a "core" -- i.e. adjusted -- $113 million ($1.28 per share) net operating profit. 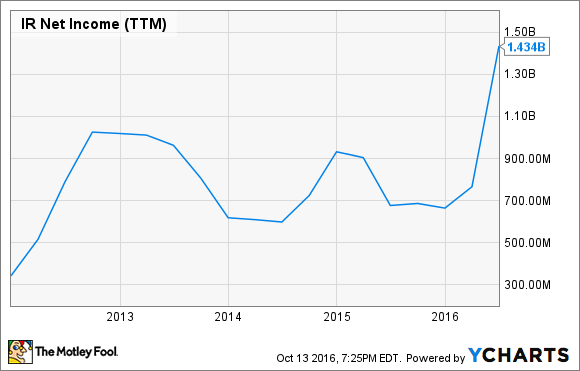 The core earnings train should keep rolling: the company has maintained its fiscal 2016 core EPS guidance of $5.35 to $5.75 per share. If it hits the higher end of that range, it would top the all-time high of $5.44 it reached in 2015. The company's success has filtered down into its free cash flow figure, which has more than doubled over the past five years to land at over $1.2 billion in 2015. Typically for a financial stock, it pays only a sliver of this out in dividends, so it should easily manage to keep that annual raise streak alive for at least a good while. 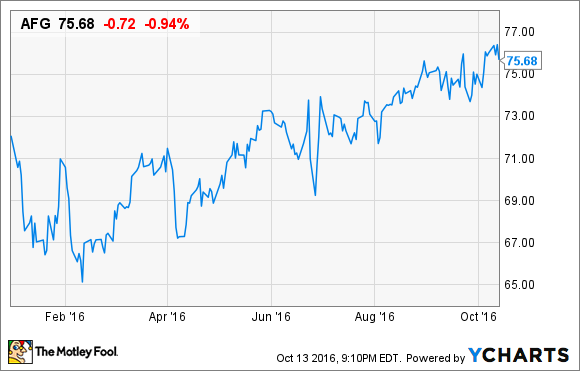 American Financial will pay its next dividend on Oct. 25 to shareholders of record as of Oct. 14. It would yield 1.7% on the most recent closing stock price.